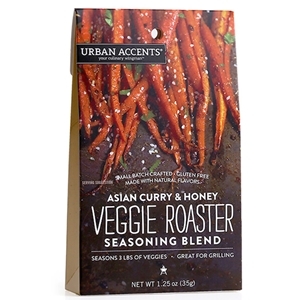 Roasting veggies with a Asian flavor is easy with our Veggie Roaster blend of honey, cumin, red pepper, peppercorns, sugar, onions and spices. Just mix with olive oil then toss with carrots, potatoes or any root veggie and roast! Ingredients: Granulated Honey, Salt, Ground Cumin, Red Bell Pepper, Ground Peppercorns, Sugar, Ground Coriander, Granulated Onion, Turmeric, Cayenne Pepper, Vanilla Bean Powder.